Twice AIBA World Champion and defending Olympic Games winner, China's superstar Zou Shiming is back on track with an impressive victory on the opening day of the AIBA World Boxing Championships in Baku. 31 contests were held in the light flyweight and heavyweight divisions. The 30-year-old Chinese missed the last edition of the AIBA World Championships but won the National Games and the Asian Games in this Olympic era. Zou was very excited before the championships but only led 4:3 after the first round against Panamerican Games Qualification Tournament winner, Juan Gabriel Medina of the Dominican Republic. But he finally celebrated a clear 17:9 victory. Zou Shiming is still unbeaten since June 2007 and will fight against Hungary's European Championships bronze medallist, Istvan Ungvari in the next preliminary round. On the opening bout of the event, Bocskai Memorial Tournament bronze medallist, Abdelali Daraa of Morocco eliminated a really strong opponent, Ukraine's National Champion, 21-year-old Denis Kozaruk by 16:7 and will face Germany's National Champion, Hamza Touba who thrashed Malaysia's Arafura Games winner, Mohamed Fuad Bin Mohamed Redzuan by 14:8. Philippines' new boxing sensation, Sydney Jackson Memorial Tournament winner, 18-year-old Mark Anthony Barriga eliminated Romania's youth boxer Stefan Caslarov by 12:5 and will face Ireland's great prospect, European Champion and Commonwealth Games gold medallist, Patrick Barnes. Eros Correa surprisingly won the US National Olympic Trials last month and had a successful debut at the international level outside his continent against Mauritius' Commonwealth Championships silver medallist, Olivier Lavigilante. 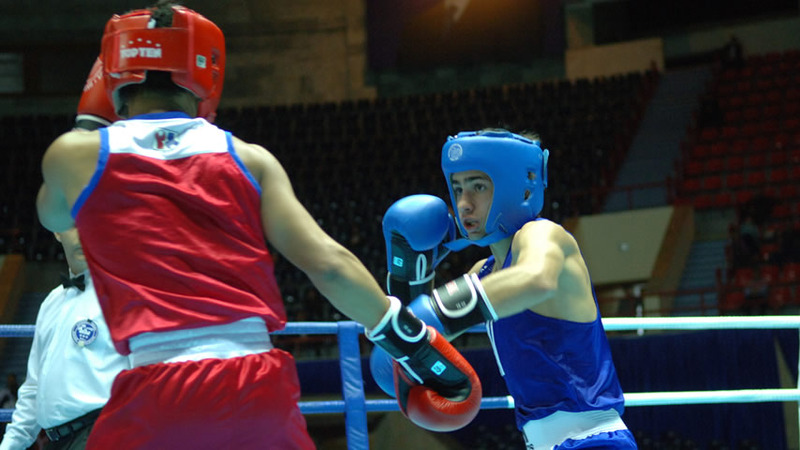 The 18-year-old US boxer knocked-down twice his Mauritian rival and will have a stronger opponent in the next preliminary round with Russian AIBA World Championships silver medallist and European Champion, David Ayrapetyan. At the All Africa Games final, Cameroons AIBA President's Cup silver medallist, Willy Thomas Essomba defeated Algeria's World Combat Games bronze medallist, Mohamed Flissi. On their re-match two and a half weeks after, the 24-year-old 'Lion' had the same impressive victory over his North African rival. One of the best fight of the day was between AIBA World Championships bronze medallist, Birzhan Zhakipov of Kazakhstan and Cuba's AIBA Youth World Championships bronze medallist, newcomer Yosvany Veitia. The Cuban stopped his favourite Central Asian opponent due to his magnificent final round. Veitia's next opponent will be Japan's President's Cup winner, 18-year-old Naoya Inoue. South American Games silver medallist, Argentinean Junior Zarate and European Championships bronze medallist, 18-year-old Charlie Edwards of England had a great battle. The result able was showing 10:10 after 6 minutes and finally ended on a very close 17:15 for the 22-year-old 'Gaucho'. Turkey's European Championships bronze medallist, Ferhat Pehlivan got involved in the national team in 2006. He then had enough experience to beat Venezuela's Beijing Olympian and Bolivarian Alternative Games winner, Eduard Bermudez. The Turkish boxer used all of his skills to win by accepted scores. Fifteen bouts of the heavyweight class were also scheduled on this opening day in Baku. Lithuania's Algirdas Socikas Tournament winner, Evgenijus Tutkus won each of the three rounds against Venezuela's South American Games bronze medallist, Wilfredo Rivero and advanced to the next round. European Championships silver medallist, Belarus' Sergey Korneyev is the only boxer who could beat Ukraine's top favourite Oleksandr Usyk this year, His clear victory over Beijing Olympian veteran, Colombian Deivis Julio is not a surprise. The winner will fight against Poland's young Michal Olas who just moved from kickboxing to boxing. Argentina's Yamil Peralta secured a silver medal at the Pan-American Games Qualification Tournament and his rival in the first preliminary was Commonwealth Games quarter-finalist, Samir El-Mais from Canada. Peralta, although eleven years younger than his opponent, had not enough experience to stop the Canadian. Barbados' Anderson Emmanuel performed excellent on his debut against F.Y.R. of Macedonia's Dimitar Taskov and will face reigning European Champion and Azerbaijan's top favourite, Teymur Mammadov in the next preliminary. Cuba's AIBA World Championships bronze medallist and former AIBA Youth World Champion, Jose Angel Larduet shocked Laszlo Papp Memorial Tournament winner, Czech Lubos Velecky in the first round of their bout. The referee stopped the contest after two minutes when the Cuban athlete was already leading by 14:2. Jordan's strong Arabic Champion and Asian Championships bronze medallist, Ihab Darweish Al-Matbouli demonstrated his power against Denmark's European Championships competitor Peter Gram Pedersen. As expected the Jordan heavyweight star won by a large margin of points (30:9). Former European Junior Champion, Kyrgyz Sergey Sklyarov had to fight against Iran's Great Silk Way Tournament bronze medallist, Reza Moradkhani in the first round and led by 3:1 after three minutes but his opponent turned the fight and advanced to the next round. Joseph Williams, who achieved only a silver medal at the US National Olympic Trials but replaced an injured Michael Hunter, has started with a victory over European Championships quarter-finalist, Sandro Dirnfeld of Slovakia. The US boxer knocked-down Dirnfeld and got the leading in the first round to finally win by 19:13. Gunnar Kristinsson is the first ever Icelandic boxer who could attend the World Championships. He was stopped by AIBA World Championships bronze medallist, veteran Alexander Povernov of Germany. Despite his early loss, the heavyweight boxer was not that disappointed.